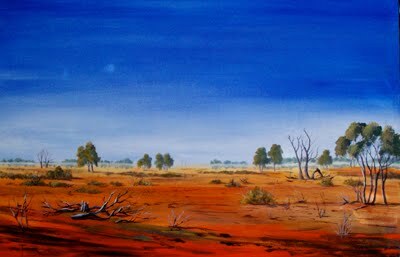 COLOURS OF AUSTRALIA - Artist's Acrylic - 30"wide x 20" high. This painting was in response to the country on the way to Broken Hill in New South Wales. The gorgeous reds in the soil, the mirage in the distance, the smallish, stunted mallee type of trees and dead stumps etc. You can have a look in the Gallery section under Acrylic to check price and confirm size in mm. There are more Australian landscapes on the way - so stay tuned for more work. (P.S. I have just noticed there are a couple of sunlight spots on the photo of this painting - they are on the photo only - not the painting).